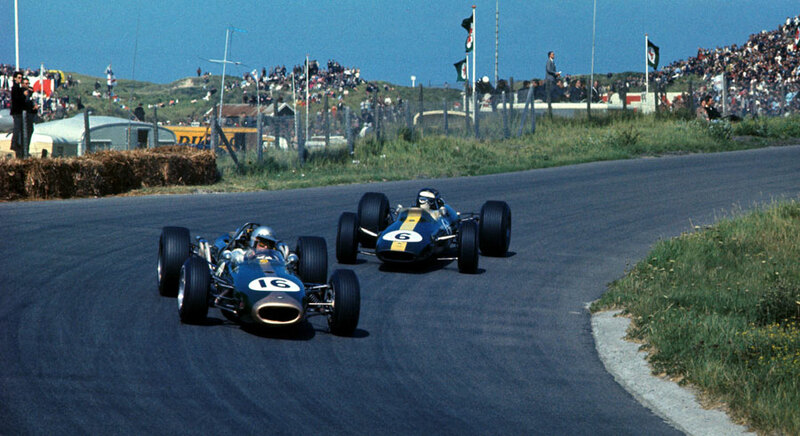 Jack Brabham completed his third successive win in the Dutch Grand Prix at Zandvoort, and in so doing took a complete stranglehold on the world championship. Written off by many as being too old at 40, he took umbrage at references such as 'the grand old man of motor racing'. "Whiskers hanging down to his waist, clutching a stick for support, a bent figure hobbled onto the starting grid and made his way slowly to a sleek green-and-gold car sitting in the front row," Time reported. "Then, with a smirk at the astonished crowd, Jack Brabham dropped the cane, pulled off the whiskers, revved up the engine of his Brabham-Repco racer, and roared off." Jim Clark, the defending champion, refused to go down without a fight and led from the start with Brabham, Graham Hill and Jochen Rindt snapping at his tail. Rindt was the first to fall away when he inadvertently changed from fifth gear to first, destroying his Maserati's gearbox, and soon after Michael Parkes spun his Ferrari after also missing a gear. Denny Hulme briefly took the lead before pitting with ignition trouble, and thereafter Clark led until, with 13 laps remaining, the engine on his Lotus overheated and he was forced to pit. He returned, but after a second pit stop had to settle for third behind Brabham and the BRM of Hill. Asked a Dutch reporter: "Don't you think it is extraordinary and astonishing that you are leading in this world championship at your age?" Replied Jack: "Why?"